This Idaho hotel, a 7-minute drive from Lake Coeur D’Alene and City Park & Beach, features an indoor pool, 24-hour gym and library. Rooms offer cable TV with video games. Holiday Inn Express Hotel & Suites Coeur D'Alene I-90 Exit 11 provides comfortable and spacious rooms with a microwave, refrigerator and coffee maker. There is a desk and sitting area as well. Guests can enjoy free Wi-Fi in public areas, including the business center. They can also relax in the jacuzzi or by the fireplace with a book from the hotel’s library. The hotel serves breakfast and offers barbecue facilities and a fire pit. A complimentary dinner, including beer, wine, and soda, is served on Tuesdays, Wednesdays, and Thursdays. North Idaho College and Coeur D'Alene Public Golf Club are 1 mile from Holiday Inn Coeur D’Alene. Silverwood Theme Park is 16 miles away. This Coeur d'Alene is one mile from Wild Waters water park. The hotel offers an indoor swimming pool with jacuzzi, a daily continental breakfast and free Wi-Fi. At the Comfort Inn & Suites Coeur d'Alene, guest rooms are equipped with cable TV and a work desk. The spacious private bathroom is equipped with a hairdryer and ironing facilities. North Idaho College is within a 10-minute drive of the Coeur d'Alene Comfort Inn. Lake Coeur d'Alene and the Silver Lake Mall are one mile away. The Coeur d'Alene Golf Course is 3 miles away. Located less than 20 minutes from Silverwood Amusement Park and 5 minutes outside of downtown Coeur D'Alene, Idaho, this hotel offers an on-site restaurant and free Wi-Fi in guest rooms. The Coeur D’Alene Guesthouse Inn accommodations include a microwave and refrigerator. They are equipped with a work desk and cable TV. A coffee maker is also provided. A continental breakfast is served every morning at this pet friendly hotel. A business center is available as well as laundry facilities. Coeur D’Alene City Park and Beach is 5 minutes from Guesthouse Inn Coeur D Alene. North Idaho College is less than 10 minutes from the hotel. Located in Coeur d’Alene, this hotel is 5 minutes from Coeur d' Alene Lake and boardwalk. It offers an indoor pool and jacuzzi 24 hours and rooms with free Wi-Fi. Rooms at the La Quinta Inn & Suites Coeur D'Alene are all equipped with a microwave, refrigerator and coffee maker. Each spacious room also offers cable TV and a work desk. La Quinta Inn Coeur D'Alene provides a deluxe continental breakfast including hot homemade waffles. Guests have free access to the business center and newspapers are available in the lobby. The Museum of North Idaho is just a 5-minute drive from the Coeur d’Alene La Quinta Inn and North Idaho College is a 10-minute drive away. Silverwood Theme and Water Park is within a 30 minutes of this hotel. This Coeur d'Alene, Idaho motel features a heated outdoor pool, indoor hot tub and arcade room. Located a 17-minute drive from Silverwood Theme Park, it offers a flat-screen satellite TV with HBO in every room. Free Wi-Fi, a microwave and fridge are provided in the spacious, traditionally decorated rooms at Silver Lake Motel. There is also a desk. Coffee makers and hairdryers are available upon request. This family friendly motel serves a daily continental breakfast. It offers an outdoor lounge in May and karaoke. Wild Waters Waterslide Park is a 5-minute drive from Silver Lake Motel. Hayden Lake is 3 miles away and Silver Lake Mall is within walking distance. Coeur D’Alene Golf Course is 0.5 miles from this all-suite motel in Idaho. The motel features a gourmet breakfast, free Wi-Fi and suites with refrigerators. Cable TV and coffee facilities are in every suite at Japan House Suites. Each suite has a work desk and is decorated in with white linens and wood furniture. Bicycle rentals and a business center are available at the motel. Guests can sit outside on the sun terrace and relax or cook on the barbecue facilities. North Idaho College is 2.2 miles from Coeur D’Alene Japan House Suites. The City Park & Beach is 1.6 miles away. Starting at 07:00 through 09:00 the daily breakfast features steak and eggs, bacon and fresh coffee. Located 2 miles from Coeur D'Alene Airport, this hotel features an indoor pool and hot tub. It serves a daily continental breakfast and has a restaurant on-site. All rooms have free Wi-Fi. A flat-screen satellite TV is provided in each air-conditioned guest room at Best Western Plus Coeur d'Alene Inn. All rooms have a microwave, refrigerator and a work desk. Serving American cuisine, Mulligan's restaurant is located at Coeur d’Alene Best Western. The restaurant is open daily and features a sports bar and lounge. Guests of Best Western Plus Coeur d’Alene can workout in the fitness center. A business center with fax and photocopying services is also available. Coeur D'Alene Public Golf Club is one mile from this hotel. Hayden Lake is 10 miles away. Spokane River Recreation Area is a 17 minute drive away. Featuring an indoor swimming pool, this Coeur d'Alene, Idaho hotel is a 25-minute drive from Silverwood Theme Park. Free Wi-Fi is provided in all rooms. Featuring a balcony, this room includes a flat-screen TV and a private bathroom at Hampton Inn and Suites Coeur d'Alene. Crisp white linens are showcased throughout. A free continental breakfast is served daily. 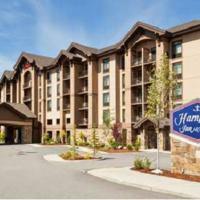 A 24-hour front desk welcomes guests to Coeur d'Alene Hampton Inn and Suites. A fitness center is also available. The entrance to Coeur D’Alene National Forest is a 20-minute drive from Hampton Inn and Suites Coeur d'Alene. Spokane International Airport is a 40-minute drive away. Located on Lake Coeur d’Alene, this aparthotel features an indoor pool and outdoor volleyball court. Apartments feature a fully equipped kitchen. A living room with a bed that pulls down from the wall, a fireplace and satellite TV with a DVD player is offered in every apartment at the WorldMark Arrow Point. A balcony is also included. A seasonal lakefront restaurant is open from Memorial Day through Labor Day. A 24-hour front desk is provided at the Arrow Point WorldMark for guest convenience. Coeur d’Alene Public Golf Club and the Museum of North Idaho are both 30 minutes’ drive from the aparthotel. Featuring a spacious indoor swimming pool and hot tub, this energy efficient Coeur d'Alene, Idaho hotel is less than a mile from Lake Coeur d'Alene. A free breakfast is offered to guests’ daily. Offering free Wi-Fi, each modern room provides 42" cable TV and an en suite bathroom at SpringHill Suites Coeur d'Alene. Coffee-making facilities, a microwave and a petite fridge are also featured. Rooms are styled in modern white linens, wood furnishing and refreshing aqua blue accents. Cereals, breads, juice and coffee are just some of the breakfast items offered daily. A patio with a fire pit and lounge seating is featured. A three hole putting green is available to guests. A fitness centre and business centre are provided. Dry cleaning services are offered near the 24-hour reception at Coeur d'Alene SpringHill Suites. Spokane International Airport is 35 miles away from SpringHill Suites Coeur d'Alene. The entrance to Coeur d’Alene National Forest is 20 minutes’ drive away.